How Do Healthy Gums Become Diseased? 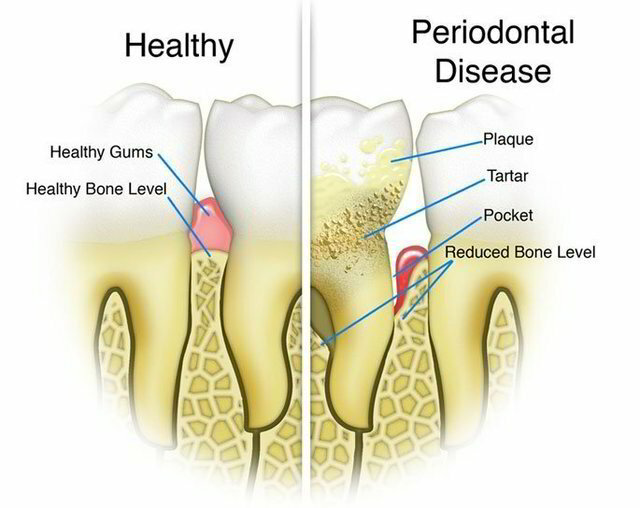 Periodontal disease is caused by plaque that forms on teeth. Plaque will irritate gums, causing them to become red, tender, and swollen. If not removed, plaque hardens to form tartar. Over time, the tissue that attaches the gums to the teeth is destroyed and the gums pull away from the teeth. Small pockets form between the teeth and gums and fill with more plaque. Eventually, the jawbone supporting the teeth is destroyed. Other causes of periodontal disease are smoking, excessive consumption of alcohol, improper use of dental floss and toothpicks, an unbalanced diet, vitamin C deficiency, pregnancy and certain medications. Warning signs to look out for are gums that bleed when you brush your teeth, red, swollen or receding gums, Pus between teeth, loose teeth, bad breath, and a change in your bite or the way your dentures fit. The type of treatment required depends on the stage of the disease. In the early stages your dentist will recommend professional cleaning followed by daily brushing and flossing. When gum disease is more serious, your dentist may have to remove the infected gum tissue. Surgery can sometimes involve reshaping the bone around the tooth or removing a portion of the bone. In the most serious cases, you may loose a tooth. Your dentist will advise you on the best way to replace it. People usually don't show signs of gum disease until they are in their 30s or 40s. Men are more likely to have periodontal disease than women. Although teenagers rarely develop periodontitis, they can develop gingivitis, the milder form of gum disease.Most commonly, gum disease develops when plaque is allowed to build up along and under the gum line. Certain risk factors can make gum disease worse. If you have one of the following risk factors, you should be extra committed to taking care of your teeth and gums. If you value your oral as well as your overall health, a periodontal evaluation is a good idea. Sometimes the only way to detect periodontal disease is through a periodontal evaluation. Research suggests that the bacteria that cause periodontal disease can pass through saliva. This means the common contact of saliva in families puts children and couples at risk for contracting the periodontal disease of another family member. Successful periodontal therapy with regular periodic maintenance care can sustain periodontal health and reduce tooth loss. The successful long term control of periodontal disease depends on active maintenance care through supportive periodontal treatment. A customised program will be “set-up” for you that will allow us to monitor for recurring disease and your plaque control efficiency. What is the treatment for the early stages of gum disease?